An introduction to the other Ring cycle. 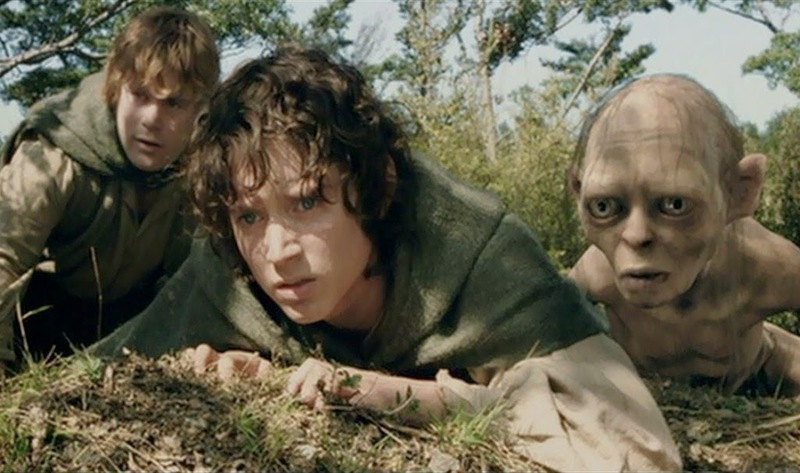 Gollum (Andy Serkis, right)in a tense moment from The Lord of the Rings: The Two Towers. This week Superconductor will visit the other massive Western art-work concerned with some dwarves, some heroes and a Ring of Power that these creatures will kill to possess. We will be attending and writing about the 21st Symphony Orchestra and Chorus's current stand at Lincoln Center's David H. Koch Theater. There, conductor Ludwig Wicki will lead 250 musicians and singers in composer Howard Shore's orchestral score of The Lord of the Rings in conjunction with screenings of the Academy Award-winning trilogy. I discovered Wagner's Ring when I was just 16 years old, but found J.R.R. Tolkien's The Lord of the Rings even earlier. I was ten when I read the first book in Tolkien's trilogy, set in a mythical land he called Middle-Earth. The books need little introduction. Nor do the three films The Fellowship of the Ring (March 7, 8 and 11) The Two Towers and the Academy Award-winner for Best Picture of 2003, The Return of the King. Each movie, directed and co-written by the New Zealand filmmaker Peter Jackson, is a massive three-hour epic, loaded with spectacular visuals and production design, and a strong cast led by Elijah Wood, Viggo Mortensen, Andy Serkis, Cate Blanchett and Sir Ian McKellen. The Lord of the Rings (technically, it's one long novel in six parts, usually published in three volumes plus an appendix) is the story of the hobbits Frodo Baggins (Wood) and Sam Gamgee (Sean Astin) and their arduous journey to the shadowed land of Mordor, in a quest to destroy a magic ring of power that happens to be the property of Sauron, the Dark Lord. That journey to the fiery heart of darkness is intertwined with the story of Sauron's war against Middle-Earth and the end of an era where elves walked the land and herbs and hobbits (like humans, only smaller and always barefoot) were still relatively easy to find. J.R.R.Tolkien was an Oxford professor specializing in philology. His study of languages led him to infuse Middle-Earth with (at least) four spoken, written and sung tongues, each with their own alphabet and tongue-busting languages. The books and films also resound with songs, legends, lays, tales, and poetry, from the epic story of the Elven king Gil-galad to Sam's song about a troll looking for a meal. A number of these songs infuse the movies, adding spice to Howard Shore's spectacular, award-winning orchestral score. There are correlations between Tolkien's story and Wagner's own Ring, as Tolkien drew heavily from Nordic and Germanic myth in the creation of his fantasy world. The Fellowship of the Ring features not one but two sword-swinging heroes, with Aragorn (Mr. Mortensen) showing Siegfried's better characteristics (the re-forged sword, the heroic bluster) and Boromir (Sean Bean) taking the lesser (the arrogance and avarice.) It could also be said that the battling wizards Gandalf (Sir Ian) and Saruman (Sir Christopher Lee) embody some of the characteristics of Wotan's own split personality--one wants to save the world and the other wants to fortify his position against an eventual hostile takeover. Mr. Shore's score fuses Wagnerian orchestral leitmotifs, Scandinavian folk melodies and huge orchestral and choral forces to bring the world of Middle-Earth to vivid musical life. The score incorporates solo vocal melodies, deep bass chanting (in Tolkien's made-up dwarvish language Khudzul, no less!) and rousing fanfares of strings and brass to accompany the heroes on their journey. Rich in detail and color, this is film music of the highest caliber in the tradition of Korngold, Waxman and Herrmann, fusing swashbuckling epic with genuine character development and heroic pathos. Performances also feature the Brooklyn Youth Chorus and singer Kaitlyn Lusk in the key solo moments. All performances are at 7:30pm (with additional Saturday and Sunday matinees) at the David H. Koch Theater. Tickets are very limited. Further information is available at the official website. See you on the road to Middle-Earth!